If you dont have the BPA, you can download it here. Click Go To Welcome Screen, then Select Options For a New Scan. Enter a label if you wish, I generally do not. Click Start Scan. Yours might be different, but whatever the issue is, you should resolve it. My issue is that a DNS A resource points to two ip addresses: my server IP of 192.168.1.113 and my RRAS IP of 192.168.1.16. I wont be solving this at this time as it is not causing issues, but I will show you how to stop the daily alert from the BPA. When you install the BPA, it sets a scheduled task to run nightly. This is cool, but I don’t need it running nightly- I run it once a week, or after major changes to Windows- why does it need to run daily. Go to Control Panel>Administrative Tools>Task Scheduler. Click Task Scheduler Library- you should see a few scheduled tasks, one of them being SBS 2008 BPA. Right click the task, and click Delete and confirm. 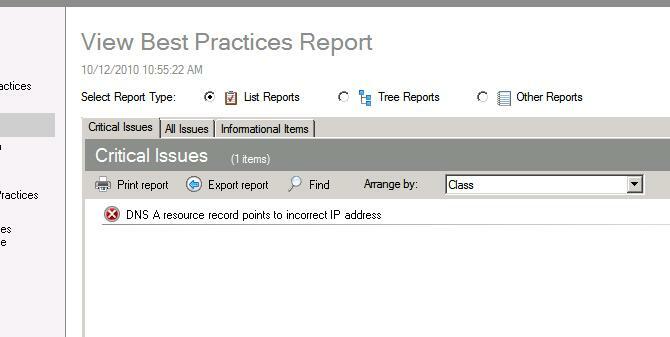 Keep in mind that “Hide this alert from all results” from inside of the BPA will not stop the computer alert from displaying in the SBS Console. UPDATE: One more thing you will need to do. Go to the SBS console, and click the Network tab. then click View Notification Settings on the right menu. 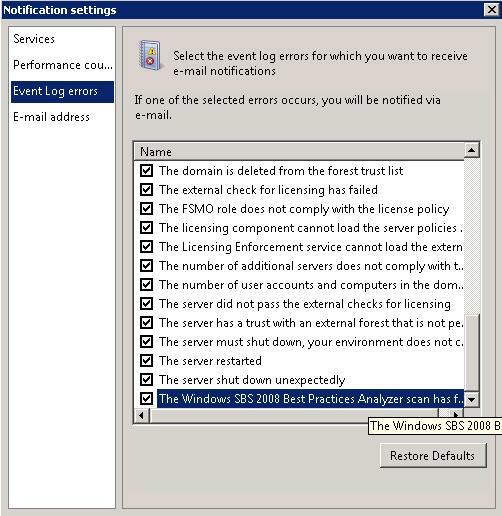 The click Event Log Errors on the left manu. At the bottom, uncheck the BPA alert notification.